Everything in the world today is gearing towards hiding one’s privacy. You want to send money across the world with no clue of who sent the money and to whom. You want to visit your favorite sites without being tracked. Even having to protect your files and applications over the internet sometimes means you have to initiate your connectivity anonymously, as direct hits can be made on your personal computer and vital information stolen. If security and anonymity are important to you, then you should think of subscribing to a VPN service. A VPN known as a Virtual Private Network is a method used to add privacy and security to public and private networks like the Internet and also WiFi Hotspots. It’s used by individuals and corporations to secure essential data. The VPN software application does the job of replacing the initial IP address assigned to a computer over the internet and replaces it with one from your VPN service provider. For instance, Bitcoin is said to be anonymous but not entirely. With the Bitcoin protocol, when a transaction is made, it is posted to the blockchain unencrypted and in clear, plain text. Cryptocurrencies that claim to be anonymous such as Dash, Zcash, and Monero are yet to encrypt traffic on nodes, so it’s still possible for ISPs and security agencies to get information on where transaction blocks were created as Bitcoin addresses are linked to IP addresses. These can be used to de-anonymize users and their transactions. This has resulted in many users subscribing to VPN services in other to divert attention from themselves. What is TorGuard And What Do They Offer? With TorGuard, you’ll be able to anonymously browse the world wide web and hide your IP Address which gives details about you and your location. You’ll also be able to bypass, block sites (sites restricted to individual countries) and firewall sites, while masking your location thereby keeping your self-safe and identity secret from hackers and other people on the web. With TorGuard you have some VPN protocol and encryption cipher options to choose. Because your IP address is your digital identification, TorGuard provides subscribers with the best options to prevent websites or people from identifying your real location from your IP addresses. Messages/data packets sent through your network are also made unreadable through these settings by converting those packets into cipher or codes. The goal is to make sure only authorized recipients can decrypt and view the data sent in plain text. TorGuards multiple Stealth VPN tunnel types make figuring out your real identity difficult. Though many VPN providers promise complete masking but after a thorough inspection by hackers or firewalls, the real identity of the user is discovered. The Stealth VPN options though can completely disguise the user as a regular web traffic even when subjected to in-depth packet inspections. TorGuard provides you with incredible VPN speeds in more than 57 countries. VPN speed is crucial, and without a fast connection speed, it is impossible to get data-intensive tasks done like streaming HD videos over the internet and other things. TorGuard gives super lightning fast VPN connectivity through their various servers. TorGuard Allows Cryptocurrency Payments. If you have to go private on the internet by making sure none of your details are made public, you should as well start your anonymity journey by choosing a VPN service provider that you can make payment without revealing your identity. They accept payments in Bitcoin, Litecoin, Ethereum, and lots of other cryptocurrencies. Not only does paying with cryptocurrencies make your anonymous but also quickens your transaction process. You also get discounts when you pay with cryptocurrencies. Getting on board with TorGuard VPN service is quite straightforward. You’ll be up and running in 3 easy steps. All you need is to download the software from the downloads page (you download the version for your operating system), click through the setup guide of the installation software, and log in to TorGuard using the registered login details you entered when purchasing your preferred VPN service. The software is available for all major operating systems (PC and Mobile); Windows, Mac OSX, Linux, Android, or iOS. There are several reasons you might want to use a VPN service provider. The first that comes to mind is anonymous as previously mentioned but there are also several reasons why people make use of VPNs. In some countries, some sites are restricted to the citizens for one reason or another. The only way people can access such services or websites in such cases is to by subscribing to VPN services. Aside from making your activities private, your emails are also easy targets for hackers if they are not encrypted. They try to steal valuable information that could cause serious havoc at times. TorGuard also provides options for anonymous email packages. You get a free 10mb space for your emails for any VPN service you subscribe. VPNs are that extra layer of security and a way of securing transactions over the network. Not just corporate organizations but also individuals need a VPN service. 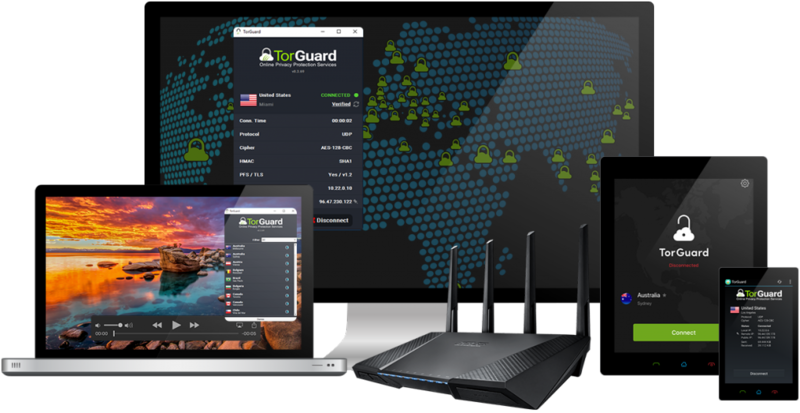 With less than $5 a month, you are assured of being wholly secured on the Internet with TorGuard.